Back in February, the British Ecological Society’s Special Interest Group in Conservation Ecology (which I’m enjoying Chairing) ran a thoroughly interesting event in London on what Brexit might mean to/for early career ecologists. It was a sell-out, despite concerns of Brexit-fatigue. And I was so impressed by the level of engagement of those that attended. It was expertly organised by Dr Andy Suggitt, whom wrote a great piece on the event here. Kate Howlett has also written this and this piece on the day, which provide another interesting perspective on the event and learnings from it. Some wisdom from Dame Georgina Mace, whom herself confessed being pretty baffled by what the future might hold. One of the key learnings I took away from the event was concerning the one (ONE) positive outcome that could (COULD) result from Brexit: the ability for the UK to manage their agricultural landscapes independently from the top-down regulation currently dictated by the Common Agricultural Policy. Leaving the EU would mean we could reform the policies which dictate how we manage the countryside, mostly those rules and structures which presently determine to what degree we degrade our rural environments in the different corners of our green and pleasant island. “Common” is perhaps a warning sign for any environmental policy, which requires the particularities of the “local” to be central in decision-making if a policy is to stand any chance of being “sustainable”. But that was never the central aim of the CAP. Perhaps, if someone does finally make a decision on which direction the UK will go in (before it self-implodes) we can create a nature-focused LAP: a Local Agricultural Policy, which considers the lay of the land, the local livelihoods, and the living biodiversity, above- and below-ground (e.g. our down-trodden worms). But we only could leave the EU. And we only could have the bravery and sense in Leadership to listen to the evidence for how to responsibly, perhaps even sustainably manage our countryside and the resources within it. And if we don’t leave the EU, we could try to reform things from within; building on the important research (e.g.) that is already being done in the UK and Europe on what sustainable agriculture might look like. We need to hook those scientists up with the policy makers and shapers. And wouldn’t that be great – to have a leading influence across Europe. The worms would be proud. What does the future hold for our green and pleasant, and depauperate land? Back in June, a bunch of my BCM cohort made a pilgrimage back to Oxford to reunite after ten years out in the big wide World after our MSc. in Biodiversity, Conservation and Management. It was fantastic to see each other, and through a loosely-structured day of informal presentations and discussions (and then quite a few pints) we learnt more about each other’s and our own decade of trials, errors and many adventures than we had expected to. Championed by Rowan Trebilco, Anne Christianson (who assertively planted the seed for the reunion), Laura Chartier and I produced two pieces to summarise our thoughts and learnings from the event: the first published in the SOGE (School of Geography and the Environment, University of Oxford) Trinity Term newsletter (& pasted below), and the second, longer piece, published in PLOS Early Career Researcher Community Blog. The event made me appreciate what wonderful people I met during my MSc. year, whom have become life-long friends, and whom I continue to learn so much from. And gosh, life pathways come in all sorts of unpredictable shapes and sizes. 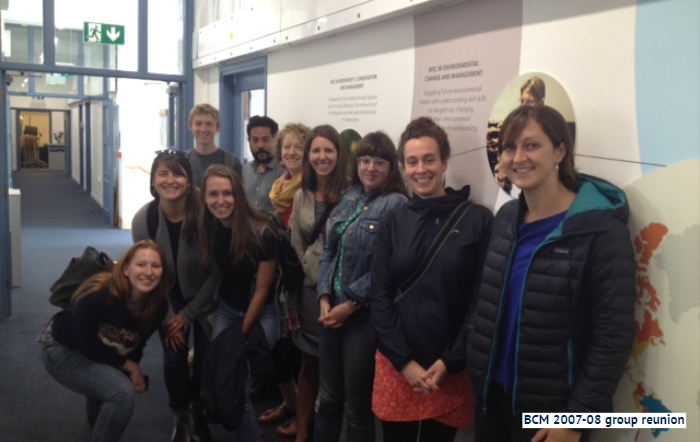 Laura Chartier presents (left) and the BCM class of 2007-08 pose for a group photo with current students (right). Ten years later, where has a multidisciplinary MSc from Oxford led us? On Friday 8 June, the 2007-08 cohort of the MSc in Biodiversity, Conservation and Management gathered in Oxford to find out. Celebrating their 10 year reunion, fifteen of the ’08 graduates summarised the last “10 years in 10 minutes” in a day of discussions on “Early career trajectories in biodiversity, conservation and management”. It was fascinating! And we certainly learnt more about everyone’s paths than we would had we gone with the initial plan of spending the day crawling between our beloved haunts of a decade ago, i.e. ye olde pubs of Oxford. The presentations followed a common format, summarising initial career goals, actual career paths, key skills obtained ‘on-the-job’, skills and knowledge we gained from BCM that have been particularly useful, and what advice we would give this cohort of students. Each presentation provided valuable insights into the development of our careers after the Masters course, with often candid revelations about the uncertain, far from “straight paths” of career development. Some alumni succeeded in several, quite unrelated careers; changing course when they realised their soul was being sapped and their grey hairs were increasing exponentially. Despite the diversity of trajectories, surprisingly consistent messages emerged from the presentations. One such key message was the importance of passion for whatever you are doing, and of stepping away if the passion isn’t there. This is not always easy when it means living back with your parents (as quite a few of us have done), sacrificing work that you’ve invested a large amount of time in, or even foregoing rapid career advancement prospects. But remaining humble throughout and believing in yourself and the important contribution you can and will make were other universal reflections. Networking and relationship-building were discussed at length, and the ways these can be accomplished as an early-career individual, without feeling phony! And importantly, gender issues and the challenges some of the women of the group have experienced warranted discussion and reflection. One thing we all agreed on was that conservation is more than a career choice: it is a mind set that can be taken into any career and shape life choices at every stage. We’d like to thank Christine Baro-Hone and Paul Jepson for helping with the event organisation, and the current BCM students who attended and provided stimulating questions and feedback. Another point of consensus from our cohort was the rich experience BCM gave us and how privileged we were to have had a year with our inspiring classmates, lecturers and community in and around Oxford’s many spires. A month ago, on Friday 4th March, I was involved in a workshop for young (as in PhD and postdoc ‘young’) ecologists that aimed to give them the tools they need to nail a career in Conservation Ecology. With limited funds in conservation (which by no means reflects the funds required by the crisis discipline, as Waldron and his buddies write about here), but an urgent need to get bright, enthusiastic young things to take the reigns, we thought this was an apt event with which to kick-start the revived British Ecology Society Conservation Ecology Special Interest Group (BES ConEco SIG – not much more digestible as an acronym!). The SIG’s revival is thanks to the hard work, enthusiasm and novel ideas of the unstoppable Dr Nathalie Pettorelli, based at the Zoological Society of London (ZSL). It’s quite an honour to be part of the Committee, and I’m excited by what the future holds for the group and its jolly followers. My main role during last month’s event was to gather material for some blog posts, to provide post-event information for those that couldn’t attend (it was a sell out!). Pasted below is the first post I wrote: Blog 1 of a six part series. I also wrote Blog 4. The others were written by Claudia, Heather and Kath, and posted on the ZSL Wild Science blog, BES blog and Journal of Applied Ecology’s The Applied Ecologist’s Blog. Hopefully there are a few bits and bobs of advice that might be useful within. This blog has also been posted on the BES and ZSL Wild Science blogs. Last Friday heralded the first training event of the revived BES Conservation Ecology Special Interest Group: an interactive workshop for Early Career Conservation Ecologists. 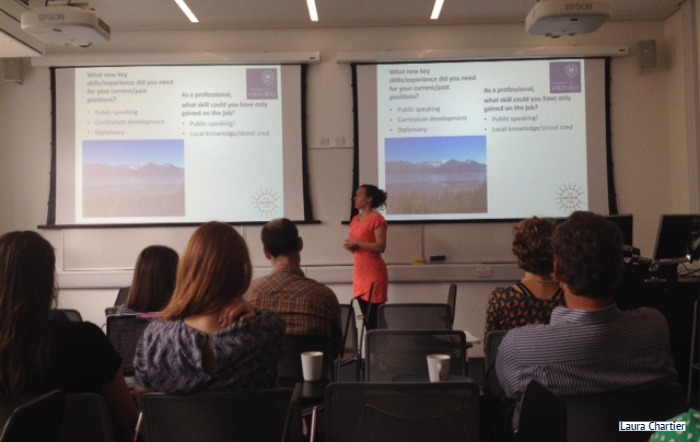 Jointly hosted by the Zoological Society of London and the British Ecological Society, the event brought together a herd of experts, working in fields ranging from journal editing, to university lecturing and policy, to guide early career attendees through five interactive sessions. The philosophy behind the day was to provide an active learning opportunity where the bright, enthusiastic cohort of PhDs and postdocs currently trying to enter the world of conservation could learn a range of skills that would better equip them for this challenge. And they flocked in their numbers, with over 65 gathering at the London Zoo, in view of the kangaroos, having travelled from as far afield as Falmouth to the south and Durham to the north. Universities are busy places, full of busy supervisors, who do not always have the time to impart knowledge on how the world (of conservation) works and how best to get into it; this workshop attempted to bring that knowledge into one room and encourage the early career enthusiasts to tap into it. At each ‘station’ ( = a round table + experts x 2 + useful materials + Post-its (of course! )), attendees were asked to perform a series of tasks to engage them with the theme, ranging from seeing how many “useful” new contacts they could make in a quick-fire networking break-out, to matching abstracts to journals, drafting a BES small grant application and put together a communication strategy for a paper about to be published. In between tasks, there was plenty of time to mine the knowledge of the experts, who must have answered several thousand questions over the course of the day (thank you, experts!). And throughout, there was not a lecture in sight! To mark the event and share the knowledge gained from it, we will be running a series of blogs over the coming fortnight, with each post focusing one of the five workshop themes. So if you missed the event, check out the blogs….and watch out for the invitation to #conscareers17! Here is a brief report I wrote for the UK Tropical Peatland Working Group (TPWG) blog last week, on the recent C-PEAT meeting convened at Columbia University in New York, for which I was honoured to attend as an early career scientist. About a month ago, from the 11th to 13th October, 52 scientists met at the Lamont-Doherty Earth Observatory at Columbia University in New York, to discuss peat. The meeting was convened by Zicheng Yu from Lehigh University in Pennsylvania, who was responsible for garnering support for this working group of PAGES. The newly fledged C-PEAT, Carbon in Peat on EArth through Time, aims to bring together peat scientists from across the world and from a range of disciplines, to answer questions about how carbon in peatlands has changed throughout the past and how it might vary into the future. I was fortunate enough to attend the meeting, along with Ian Lawson and various others that have or are still working with the UKTPWG, including Outi Lähteenoja. Here is a brief report of the meeting. The meeting crew, getting the C-PEAT ball rolling. How much and how fast can peats accumulate? What will happen to peat in the future? By the end of the three days, I think we were closer to knowing more clearly about what we don’t know, than to actually answering these questions! But we exchanged a huge amount of new information in the process, some of which I’ve reported on below, under each question. We spent one break-out session seeing if we could provide new insights into what the critical controls on peat formation might be. After learning from the talks about the huge range of peatlands present today and during the past, from the diverse forested swamps of Papua New Guinea, to the high-altitude Andean ‘cushion’ peats, to the organic-rich sediments buried under glacial tills in Canada, all with their differing physical parameters, this proved challenging. As did attempts at making generalisations about peat formation through time; time being hundreds of millions of years. One scientist aptly commented that “coal is carbon; peat is water”, which helps to explain part of the picture! There were a number of discussions about deep-time peats and coal, and whether we could make inferences on their development dynamics based on more recent peat formations. A work in progress (by the Deep-time andBuried Peats Thematic Groups). The 65m* deep Lynch’s Crater in Australia. *Numbers not verified – may have passed through multiple Chinese whispers. Breakfast chats (about peat?!) in the sunshine, at the Lamont-Doherty campus of Columbia University. Where will new peat formations arise? Where will peats disappear? And where will they persist? Will bogs persist with greater frequency than fens? Nigel Roulet, McGill University, presented on the greater resilience of bogs compared to fens, with bogs maintaining hydrological independence from the surrounding environment and therefore being more able to resist the potential impacts of climate change. Jeff Chanton, Florida State University, talked about the SPRUCE mega-project he’s involved with, in the Marcell Experimental Forest in Northern Minnesota, which is attempting to monitor how temperate peatlands respond to changes in climate. Watch this space for the release of the experiment’s findings. Ian Lawson, University of St. Andrews (and key member of the UKTPWG), presented on what we know about the tropical lowland peatlands of the Peruvian Amazon. He also talked about the threats to their persistence, one of which was an unlikely suspect: aboveground carbon maps, which demonstrate the relatively lower standing carbon stocks in peatland areas compared to in terra firme forests, and fail to illustrate their rich belowground carbon store. Ian highlighted the danger of these maps being used in land use decision-making in Peru, potentially erroneously directing forest conversion to these carbon rich areas. And these peatlands don’t have the emotive conservation pin-up that their Southeast Asian relatives have. Steve Frolking, University of New Hampshire, presented an analysis on carbon losses from tropical peatlands under different land use change scenarios into the next 50 years. An interesting desk-based exercise that warns of the strong emissions legacy of the peatland management practices that are pervasive across much of Southeast Asia now. One major area of peatland that we still know so little about was sadly not represented at the meeting: the peat swamps of Central Africa. Perhaps that gap can be filled by members of this group at the next meeting. There was also a distinct lack of anyone named Pete there. As we move into the Anthropeatscene (! ), we need to consider exactly what and where the threats to peatland persistence are. And what the opportunities are for peatland conservation. I’m sure everyone is aware of the fires that have been raging in Indonesian peatlands over the last few months (if not, look at this and this previous post), exacerbated to a great degree by unsustainable peatland management. One big question the workshop considered was: what unique contribution can C-PEAT make as a group to peatland science and conservation, in both the tropical and temperate zone? If you have the answer, or indeed any answers to the questions above….or are working on them, do join the C-PEAT mailing list by signing up here.